Does cleaning your home seem like a daunting chore with never enough time? Fear not! When it comes to speed cleaning, it’s all about time management, efficiency and prioritizing. 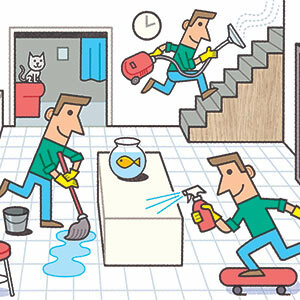 Check out these 7 steps to cleaning your home in 30 minutes. Ready, set, clean! Kick off your house cleaning spree by spending several minutes picking up the clutter from each room of the house. Grab an empty laundry basket and bring it with you as you walk from room to room. Spend a few minutes shaking out your entry rug, then, grab your cordless vacuum to nab any dust or hairs. Dot the light bulbs in your ceiling fixture with a drop of lavender essential oil. Guests will be greeted with a soothing scent that’s not overpowering. Touch up surfaces and countertops. With a paper towel sprayed with a liquid cleanser, wipe down only the areas of the counter that are dirty. Next, clean the refrigerator handle and any dingy drawer pulls. Spot-mop the floor with a spray cleaner and a scrub-back sponge so you don’t spend extra time with a bucket. Tip chairs against the kitchen table for quick and easy access to those grimy spots. Toss a clean tablecloth in the dryer. It will work out the wrinkles and appear freshly pressed in the time it takes to clean the kitchen. Stash bulky countertop appliances in a closet, and visible food in the fridge. Gather any loose paper into a single pile. Stock the bathroom with a fresh bar of soap, a full roll of toilet paper, and a few clean and pretty hand towels. Pour toilet bowl cleaner into each toilet and let it sit per the cleaner’s instructions. While you’re waiting, spray and wipe the mirrors with glass cleaner, and vacuum loose hairs with your cordless vacuum/dust buster. Spend a few minutes locating the remote, fluffing the pillows and cushions, organizing magazines in your basket or rack, and eliminating pet hairs with a lint roller. Turn off those harsh overhead lights and about half of your table lamps. This not only creates mood lighting, it makes it harder for guests to see dirt. Straighten up the bed, which is the first thing guests notice. Align the sheets, smooth the bedspread, arrange accent pillows symmetrically and fold extra blankets. Finish off your clean house in less than 30 minutes mission by grabbing a duster and moving from room to room. Opt for an extendable duster to reach high corners and low baseboards.